We often want people to contribute, give and be engaged - in conversations, in meetings/workshops or planning days, in the work at hand, in the project, in the business and the industry. It can be tough; how do you get people to contribute, to add their views and to give their input? Don’t they know we want it; after all, we asked them! In this day of co-creation and collaboration we want to and need to ensure our customers and clients get the types of solutions they need... but sheesh it can be hard work sometimes getting people to give, contribute, ‘cough-up’ and show they are engaged. We experience it when we need to extract information from customers, clients or users, or get the requirements for a project or the details for a consulting job… but we just don’t seem to get what we’re after. Sometimes we have asked a question… or four… and then we're met with …. Are they going to respond? Do they have anything to say? Somebody. Say something. Bueller, Bueller Bueller? Anyone, Anyone? If we’re leading the session or meeting we might be tempted to jump in and answer or move on or even ask another question. Or we can just feel like disappearing and going for a coffee, just to get outta there! We can wonder: Why aren’t they ‘engaged’! ? Why aren’t they contributing great ideas? Was it something I said? Worse is when we know there are great ideas to be gathered; we may have heard whispers OUTSIDE the session; why aren’t they bringing them INSIDE, to the meeting or session? So here’s the word… it’s not about engagement, it’s about elicitation. Simply saying 'people aren’t engaged on the topic' or ‘they’re not engaging in the discussion' is too much about them. Elicitation is the new engagement. Elicit means to draw forth. It means to make or create or invite, to stir up and stimulate. It can mean stronger things than this, but to elicit something is to evoke. To sparkand stir. We need to elicit. Not wait for them to engage. Elicit. Instead of blaming them for not being engaged or measuring their engagement scores, how about we measure how well we elicit information? So how are you stirring things up? What are we evoking, inviting and sparking? Do you have a good mix of open and closed questions? Do you think this is a closed question? Our workplaces need bright, enlightening discussions, epic progress, competitive products and bold decisions. Contemporary leaders know how to elicit, spark and stir. You know the scenario - it's a team meeting and you're wanting to hear contributions or input, or it's time to hear if people have questions. Even when engagement isn't that great in a meeting or workshop, the right questions will still elicit contributions. It's SO easy to answer that with question a 'no' ... so we can just keep moving and get the hell outta the dull meeting! So what thoughts are coming to mind? What questions are coming to mind? These are open questions; simple, broad, open questions. It's amazing the difference they make. They allow people to just throw something out there. Their thoughts, their wonderings, the questions they may not normally ask. Then once you've asked the question... wait. The leader who asked 'Does anyone have any questions?' waited four seconds. I counted them. It can seem like an eternity when you're the asker, but when people are thinking about their thinking and possible questions, four seconds isn't enough. Some of the BEST questions will come when people are simply given some time to come up with the questions and contributions. While you're waiting, keep looking at people, looking around the room or table at them; keep an open expression, be interested to hear what they say. Stay ready to hear what they have to say. Wait. It reminds me of outback Australian stockmen who work their herds of cattle across the land. They rely so much on their trusty four-legged co-worker, the sheep or cattle dog. 'W-a-a-a-i-i-i-i-t-t-t-t' they say, telling the dog to just hold it before they round up more cattle. Think of that before you jump in after some open questions... just w-w-w-w-a-a-a--i-i-i--t-t-t-t-. Listening to people talking is something we do every day; listening in workshops, in planning sessions, in meetings, conversations and learning environments. I don't know about you, but I hear lots of 'dirty' language! Ok, not swearing, but rather let's call it 'unclean language'. This is language where people interrupt, make assumptions, give directions, tell people what to do and dish out prescriptions. Yes... how much do you enjoy being told what to do? Often we may not intend to be so ... dirty... with our language, so it's something to be aware of. We really do need to clean up our language! Clean language has the capacity to break down silos, build trusting environments, boost our capabilities to think, evolve our ideas and deepen engagement. It's an approach identified and developed by New Zealander David Grove. More leaders, coaches, managers and drivers of change might like the idea of achieving those things. 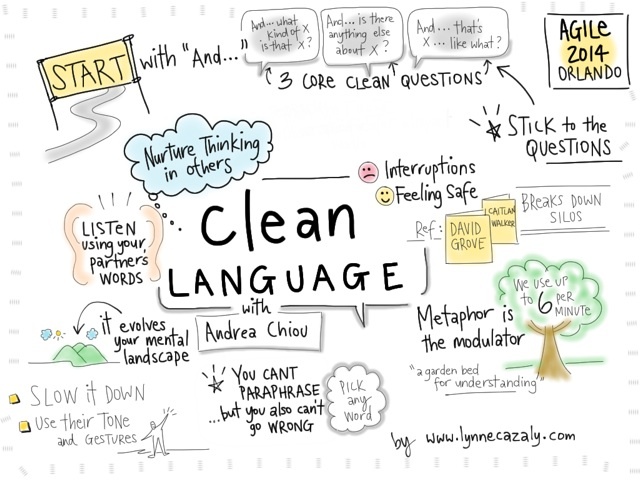 You can read more about the technicalities of clean language here and here but a session presented at a conference I was at recently reminded me of the power of this clean listening and communication tool. And what kind of x is that x? And that's x like what ? You can get the essence of the session from my visual notes. So... how 'clean' are you? How clean are the others on your team? Boost engagement, build trust and break down silos in these challenging times by cleaning things up. 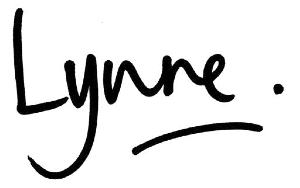 When I first got my drivers license I remember driving down a local South Melbourne street, York Street, the wrong way! There were a couple of oncoming cars but we were all moving slowly so I think I got away with it. Plus, the car I was driving was my aunt's and it had interstate number plates on it! "Oh, ok, she's not from around here!" I've always remembered the intersection to that street and when I drive past it now, I'm so very conscious of how it's 'one way'. It looks and sounds different to the whizzing traffic that flows both ways along a road or motorway. 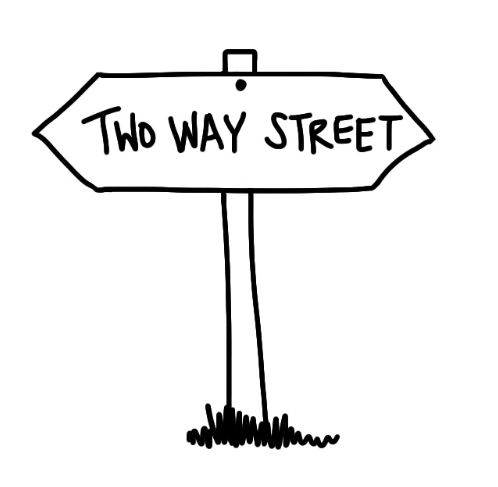 Earlier this week in a client workshop, I remembered that one way street incident. I was listening to a leader communicate their key messages about a change program and how the leaders and team members would have to do this, that, the other ... and oh, this other thing over here. It was all so 'one way'. Contrast that to another leader who I heard from yesterday. She opened the topic up for conversation. She wanted to hear what people thought about what they'd already heard about the change. This was before her 'sermon' on what was to be. By allowing a 'two way street', she was able to hear their key concerns and then pitch her information to address those concerns. It all flowed so well. They talked some… then she responded… then they asked some questions… and she engaged further. Yes it was the two way street of communication! So simple, but sometimes so tricky to bring to the situation you're in, particularly if it's a tough or tricky conversation. She later told me her heart was thumping in anticipation because she didn't know what they'd say or what their questions or concerns might be. She had some ideas, but was really heading into some unknown territory. Oh yes… uncertainty! It does wonders for our defences! It brings them on in a flurry. So rather than head down that one way street like I did, I encourage you to travel the two way street of communication... slowly. A little from them… then over to you… then back to them. It's the push and pull of communication, engagement and facilitation. Every conversation, meeting, workshop or session you're in can benefit from it. Not to mention the other 'drivers' in that meeting. Take it slow, proceed with caution and keep things moving two ways. It's too dangerous otherwise. I was graphic recording at a client's leaders meeting last week and I had the wonderful - and often rare - opportunity to be quiet, look, listen and scribe or capture the visual and verbal elements of the conversation. No need for me to facilitate or guide or lead or direct or anything! Just listen and scribe. I've been recently coaching the new team leader in handling his diverse, enthusiastic and energetic team! They are a powerhouse when they get together. Ideas flying about the room, possibilities, energy and 'let's do it' enthusiasm! We'd worked through the Facilitator 4-Step in a couple of coaching sessions and he was off and running this workshop/meeting using the model. All but one little thing; well, a big thing really. He was too 'polite' to interrupt. He let people talk on and on and on. He wanted to make sure they had their say and put their views forward. That is great. Lovely approach. Open and trusting environment... etc etc etc. In our post-workshop conversation I confirmed that yes, you can interrupt. But interrupt with something that doesn't include your own view. As a leader, facilitator, trainer or other role that's aiming to draw out, guide to an outcome or boost collaboration, you can interrupt. But interrupt with something that will serve your whole purpose for being together - not your own view or position.